SUMMARY: Distinctive intracellular structures known as inclusions may be occasionally observed on stained tissue preparations and may further suggest a specific diagnosis. Pathologists rely on these findings much as radiologists rely on findings revealed in the gray-scale patterns of densities and intensities on images. Appreciation of these inclusions can enhance the interactions of the neuroradiologist with the neuropathologist and deepen understanding of certain conditions. This report reviews the neuropathologically observed intracellular inclusions known as Rosenthal fibers in the context of Alexander disease and slow-growing tumors such as pilocytic astrocytoma. In 1898, the German pathologist Werner Rosenthal* noted elongated inclusions within the gliotic edge of a syringeal cavity of an ependymoma.3 Assigned to write the case report by a senior mentor while serving as a “first assistant” at the University of Erlangen, Rosenthal colorfully described these inclusions as a “glossy formation of little bulbs or wavy sausages with one thick and one pointed end.”3,4 Although the full significance of this finding was not appreciated for almost a century, his supposition that they were related to glial fibers would prove surprisingly insightful.3 Not until some 20 years later did Bielschowsky and Unger use the term “Rosenthal fibers” when describing structures in the gliotic capsule of a cystic teratoid tumor5; other articles reported the mysterious inclusions in association with such diverse entities as capillary hemangiomas of the spinal cord, cerebellar astrocytomas, and reactive gliosis surrounding lesions of cysticercosis.6–9 In 1949, W. Stewart Alexander described a curious form of mental retardation, hydrocephalus, and progressive degeneration in fibrillary astrocytes in an infant whose condition would later bear Alexander’s name; subsequent pathologic analysis unexpectedly revealed an overwhelming abundance of the peculiar Rosenthal fibers.10 The purpose of this report is to review the nature and significance of Rosenthal fibers in the context of glial fibers, Alexander disease, and such tumors as pilocytic astrocytomas. Photomicrograph from a pilocytic astrocytoma showing brightly staining red Rosenthal fibers (arrowheads). (Hematoxylin-eosin [H&E]; original magnification, 1000×). Drawing of the various classes and structures of intermediate filament proteins. 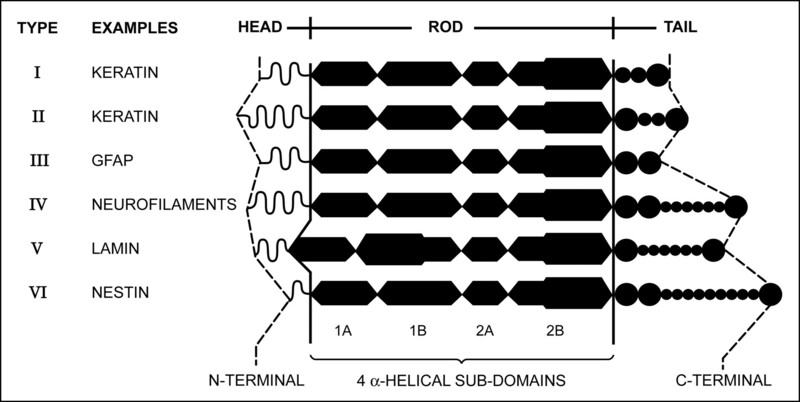 The central rod is composed of 4 α-helical sub-domains separated by nonhelical linkers. The central rods are remarkably similar among the classes, whereas the heads and tails demonstrate considerable variability and partly contribute to tissue specificity. Most of the described mutations in Alexander disease occur in the 1A and 2A subdomains of the rod. Modified from ref. 22. With permission. Information about the role of GFAP in neurologic disease has evolved over the past several decades. The demonstration of GFAP in tissue specimens taken at biopsy or resection reliably points to a glial cell lineage.20,29 Pathologic processes rich in astrocytes and thus rich in GFAP include such entities as chronic multiple sclerosis plaques and a variety of tumors. Most investigators now believe that the prevalence of GFAP in these processes is due to an upregulation of GFAP production in response to stress.27 Thus, GFAP may help to promote organized reparative gliosis after injury.28 Moreover, production of GFAP generally depends on the degree of cellular differentiation; low-grade astrocytomas are often much richer in GFAP than undifferentiated tumors.30,31 The relationship of GFAP with Rosenthal fibers is complex, and much of the understanding of these inclusions has come from the study of the rare disorder Alexander disease. 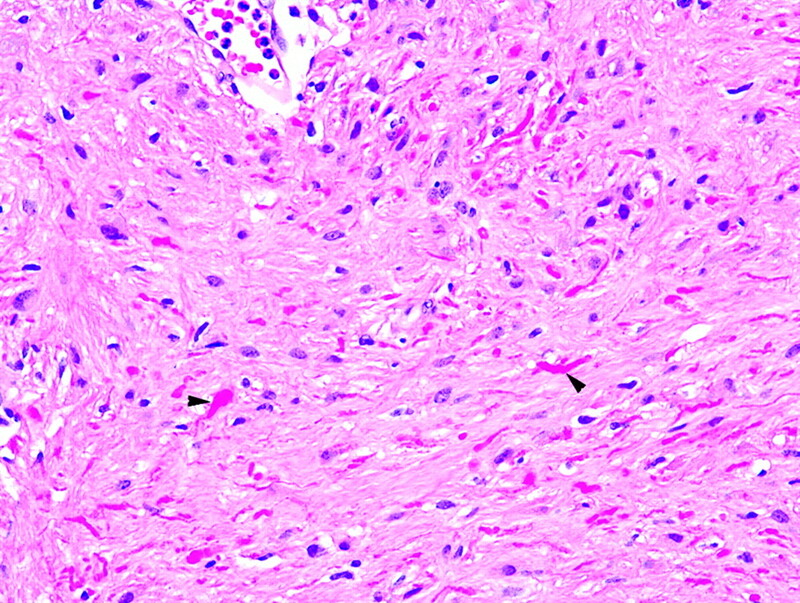 Although the spectrum of mental retardation, macrocephaly, and extensive demyelination would be unlikely to draw much attention in such a rare disorder as Alexander disease (also known as fibrinoid leukodystrophy), the pathologic finding of extraordinarily massive deposits of Rosenthal fibers raised significant questions. Especially puzzling was the association of this ostensibly developmental disease with other seemingly unrelated processes that also demonstrate Rosenthal fibers, such as pilocytic astrocytoma and the lining of syrinx cavities. Rosenthal fibers in Alexander disease reside in the astrocytes located in the deep white matter, periventricular zones, spinal cord, optic nerves, and brain stem, corresponding to areas of hyperintensity on T2-weighted MR images (Fig 3).32 As the disease progresses, the fibers enlarge and eventually reside within the astrocyte end-feet (the expanded endings of astrocyte processes that abut blood vessels) found in the subpial and perivascular zones.25,33,34 Although early investigations failed to conclusively determine the composition of the Rosenthal fibers despite a compelling and intimate association with adjacent GFAP-positive intermediate filaments,35 subsequent work showed that the Rosenthal fibers did indeed contain GFAP (or possibly some form of it) as well as ubiquitin and small heat shock proteins HSP27 and αB-crystallin.24,27,33,36–38 Ubiquitin is a protein of 76 amino acids that plays a regulatory role in nonlysosomal degradation of other proteins.24,39,40 Rosenthal fibers may contain a hybrid of ubiquitin and possibly partially degraded fragments of GFAP.37 Both ubiquitin and heat shock proteins are produced in response to stress. A, T2-weighted MR image demonstrates the marked hyperintensity in the cerebral white matter of a small child. The white matter of the frontal lobes is often initially involved with posterior progression as the disease advances. Cystic changes may also eventually develop. As in this case, the caudate heads, anterior putamina, and thalami are often involved, a hypointense periventricular rim on T2-weighted images frequently occurs (arrowheads), and the cavum septi pellucidi may be expanded (case courtesy of A. James Barkovich). B, Photomicrograph from a different patient showing extensive brightly staining red Rosenthal fibers in a predominantly subpial distribution (Hematoxylin-eosin [H&E]; original magnification, 100×). C, Photomicrograph from a different patient showing extensive brightly staining red Rosenthal fibers in a perivascular distribution (H&E; original magnification, 1000×). The presence of elevated GFAP levels and Rosenthal fibers in Alexander disease remained perplexing until the discovery of mutations in the gene encoding for GFAP, which seemed to target the rod or tail domains of the protein.12,38 Now multiple GFAP mutations are known to manifest phenotypically as Alexander disease. Equally intriguing was the mechanism for the observed disease; mice deficient in GFAP had relatively few symptoms.33 Noting that filaments are actually increased in Alexander disease, investigators now generally agree that mutations cause overexpression rather than underexpression of abnormal GFAP, which in turn causes a fatal encephalopathy.25,38 This theory is supported by observations that the overexpression of GFAP in transgenic mice causes a lethal encephalopathy and production of astrocytic inclusions virtually identical to Rosenthal fibers.25,41–43 The mutant GFAP may impair astrocyte function by blocking the normal polymerization and assembly of the intermediate filaments.38 Impaired astrocyte function may also adversely affect adjacent cells such as the oligodendroglia and cause abnormal myelination as well as other malfunctions.41 The mutant GFAP may also abnormally resist complete breakdown and clearance, resulting in a toxic effect and possibly also accounting for the presence of ubiquitin. The resultant fragments of abnormal residual filaments may then be recognizable as Rosenthal fibers. The association of Rosenthal fibers with certain tumors and other conditions is more difficult to explain. Possibly the upregulation of GFAP observed in especially well-differentiated tumors may produce abnormal variants of the protein that aggregates into Rosenthal fibers. Rosenthal fibers are also known to occur in the walls of some cysts. The irritation of the cyst protein possibly causes a stress reaction in the astrocytes that in turn results in upregulation of GFAP with possible assembly or degradation issues that lead to abnormal variants of GFAP and production of Rosenthal fibers. It is noteworthy that the presence of Rosenthal fibers is not constant among tumor types known to occasionally harbor the inclusions. On the other hand, lesions known to produce large amounts of GFAP do not necessarily also produce Rosenthal fibers. In summary, Rosenthal fibers are intracellular inclusions found in fibrous astrocytes and represent fragments of GFAP, the protein building block of glial intermediate filaments, and other proteins such as ubiquitin and heat shock proteins. Rosenthal fibers are observed in Alexander disease and certain tumors such as pilocytic astrocytoma. Although the precise event inciting the formation of these inclusions is unknown, Rosenthal fibers may represent the by-product of upregulation of GFAP in response to stress. In Alexander disease, this upregulation is now known to be linked to genetic mutations in GFAP. Regardless of the cause, the overproduction and accumulation of GFAP and mutant by-products with possibly ineffective degradation and clearing of abnormal protein deleteriously affects astrocyte function. We thank Drs. Albee Messing and Robert E. Schmidt for their suggestions on the manuscript and Dr. Markus Lämmle for his assistance in translation and collection of historical material. The opinions and assertions contained herein are the private views of the authors and are not to be construed as official or as reflecting the views of the United States Department of Defense. Accepted after revision December 19, 2005. Can MR Imaging Diagnose Adult-Onset Alexander Disease?